Nabaldian, who was Armenian by origin, was born and studied in Tiflis under Evgenii Lancere. He went on to become one of the most celebrated of Soviet artists, painting portraits of all their leaders from Stalin to Brezhnev. 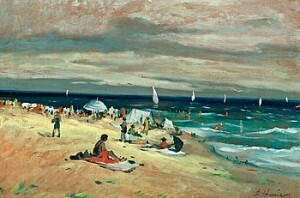 Between 1960 and 1980 he had a dacha at Nikolina Gora outside Moscow, and often painted the surrounding countryside.